Often, individuals and communities are given solutions to healthcare problems that don't meet their local needs and realities. For that reason, we aim to use local insight from Philly residents to better understand the case-specific factors that affect the health of certain neighborhoods to combat this issue. Health Insights 215 is a series of pop-up wellness events located in several community farmers’ markets throughout Philadelphia. We will be at 4th & Lehigh on July 18th and August 8th from 12 to 4 PM and 33rd & Diamond on July 26th and August 2nd from 2 to 6 PM. At these events, we will interact with community members to get their thoughts on personal health needs and challenges and those of their community. Using Insight Sheets that will be handed out to and filled out by the participants in the markets, we hope to gain insight on the issues pertaining to the health of the individuals and their communities. Based off the info we get from the first dates at the two sites, we will hopefully be able to return on the second dates with some solutions to their issues—perhaps via health education, such as diabetes prevention education, or on-site health services, such as blood-pressure screenings or healthy food demos. Philadelphia is ranked one of the top ten cities in the US for the highest poverty levels, with life expectancy differing as much as 20 years depending on where one lives. With the growing burden of chronic diseases, morbidity, and mortality, it is important to reexamine the roles medical and public health providers play in these underserved communities. By placing ourselves in these neighborhoods, we hope to gain a social ecological view of obstacles that prevent people from living a healthy lifestyle, and integrating these population health perspectives into local wellness resources. 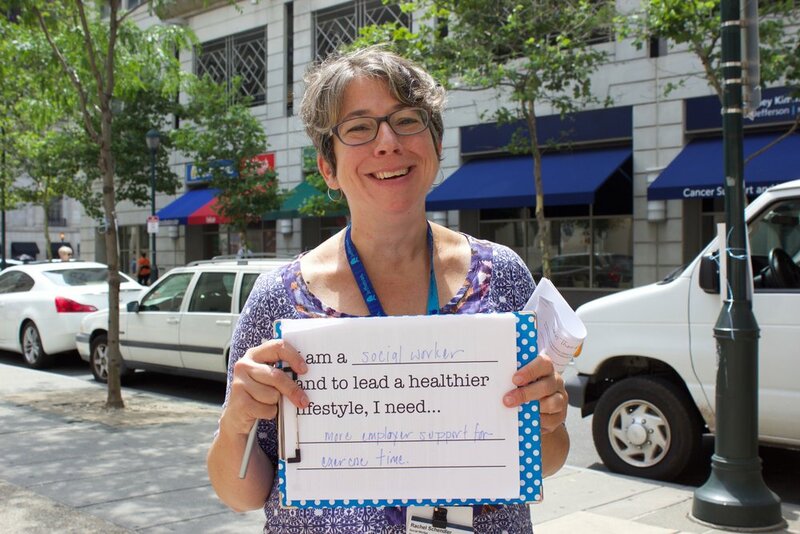 Our goal is to engage with underserved neighborhoods in Philadelphia, gaining valuable insight into what individuals and communities need in order to live a healthier lifestyle, and working with designers, funders, policy makers, non-profits, and health care providers to create a healthier built environment.